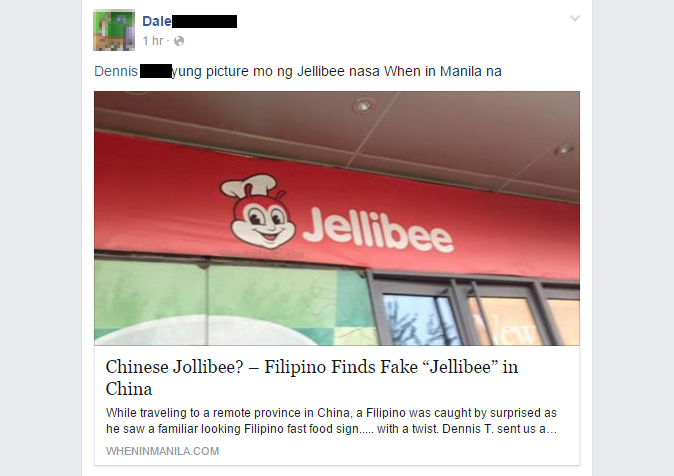 Photos of "Jellibee," said to be a restaurant in China which name was ripped off from the Filipino fastfood chain Jollibee, have circulated online. According to the news website When In Manila, the pictures were sent to them by a certain Dennis T., a Fil-Chinese who, a tipster said, lives in Xiamen Shi in the Chinese province of Fujian. Dennis reportedly said he spotted the signage with the exact Jollibee logo but with the incorrect spelling of the brand name at Wanda Plaza, a popular mall in Yinchuan, Ningxia, China. Here's the truth: It turned out to be "filler sign" of an empty space for rent situated near a KFC store. Other signs with wrongly-spelled brand names such as "Parda" (Prada) and "Pums" (Puma) can also be seen inside the mall, Dennis reportedly said. As of yet, Jollibee Foods Corporation has not issued an official statement regarding their brand name being used in a fake signage.